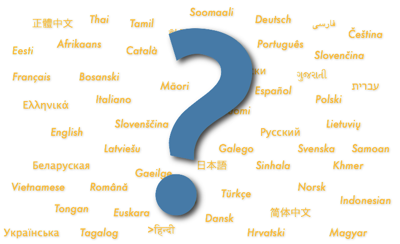 For me, one of the important questions I always have to answer before creating any kind of content is: in which language will it be? Will it be in Slovenian (my mother tongue) or in English (the international language of the web that I’ve learned as a second language)? This was, of course, also a major question when I started this blog. And sometimes I really hate this question, and I hate having to choose between languages. On one hand, writing and speaking in Slovenian is always easier for me, but by choosing Slovenian as the language for my content, I automatically limit myself to an audience of probably no more than 2 million people (and the number is even smaller if you consider the number of Slovenian speaking people that are actually interested in what I’m writing about). The fact that a lot of the current tech terms (and buzzwords) don’t yet have a good Slovenian translation, also make my decision more difficult because I sometimes feel like I’m writing half in English anyway. On the other hand, I get a much bigger potential audience by writing in English, but it makes writing/speaking a bit more difficult, and it may also make my content more difficult to understand (or maybe even relate to?) for Slovenian people that don’t speak English well or at all. And although I consider myself fluent in English, I often feel a bit insecure or self-conscious when I write or speak in English (especially for an audience of native speakers). The self-consciousness is even more apparent in synchronous communication situations - like IM or more recently with Second Life voice. When I blog or write emails I have the time to reflect, analyze, run a spellchecker, so I feel more confident (though I always worry about making typos that could be interpreted as insufficient knowledge). But no matter which language I choose, there is always the question: should I translate this to the other language? And sometimes I do translate, but usually I don’t because I don’t have the time or motivation to do it - and let’s not forget that some things are always lost in translation no matter how hard you try. There is just so much good content out there that’s impossible to translate it all back and forth to one language and another. So how can one deal with the language problem? I often choose English over Slovenian just because it helps me to get in touch with so many wonderful people around the globe, but I sometimes miss more discussions in my own language. And that is why on some levels I’m glad I can now also blog for my company’s website in Slovenian, but then again: I often wish I could share some of my Slovenian content with my English speaking friends… I guess the language question can never have just one answer. For me, it’s always a bit of a struggle, and in the end it’s up to each individual to choose his/her “side”. It isn’t easy, but I guess it’s one of the prices you have to pay to live in a flat world.